The My Weslaco app is seen. WESLACO — Residents now have an additional outlet to access their city government in the form of a mobile app. 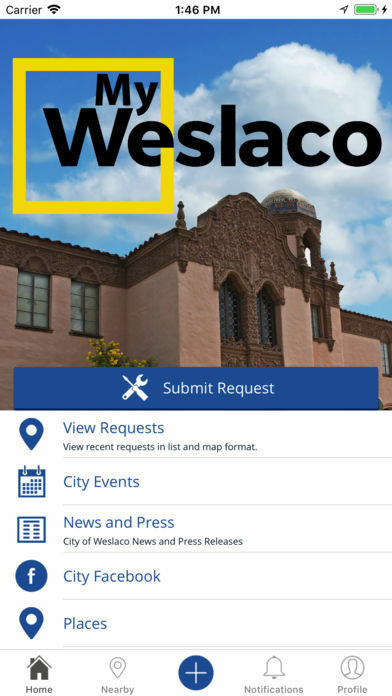 The city on Wednesday launched the “MyWeslaco” app that allows residents to essentially submit work orders directly to city staff. The app powered by Accela, a California-based company, can be downloaded onto iPhones and Android devices and features a range of options in which residents can submit complaints about anything from stray animals to potholes. There are 61 issue types to choose from, along with options to view upcoming city events and city-related news. It also allows users to contact the mayor and commissioners via email. Peña also worked for the city of McAllen when it launched the McAllen 3-1-1 app in 2013. Like in McAllen, residents can either make their complaint public, which allows other users to see it, or private. The private option gives only the user and city staff access to the submission. “What it really does, it makes the city more accountable,” Peña said. Submitted complaints are received by staff through email, and then delegated to the proper department for resolution within an allotted time frame that depends on the request at hand. The city already picked up a stray dog and addressed a weedy lot following requests in the app. Water bills can also be paid through it. Residents in “The City on the Grow” can also file complaints through the open government section on the city’s website. The city will pay $31,998 for the app over five years, according to city minutes from an August meeting. Mayor David Suarez said he hopes the app provides “better customer service” and quicker resolution to issues. “Hopefully, it can cut down on response time,” Suarez said.